Most dolomites are diagenetic replacements of limestone. Sedimentary dolomite may have been more important in the past but the best known Holocene examples come from the evaporative coastal lagoons of the Coorong, of South Australia. Currently sedimentary dolomite is thought to have been rare in the sedimentary record and most is thought to be a product of diagenesis. In contrast diagenetic dolomitization is the more important but the understanding of the process is still evolving. This encompasses an ever-increasing number of settings and geochemical models. 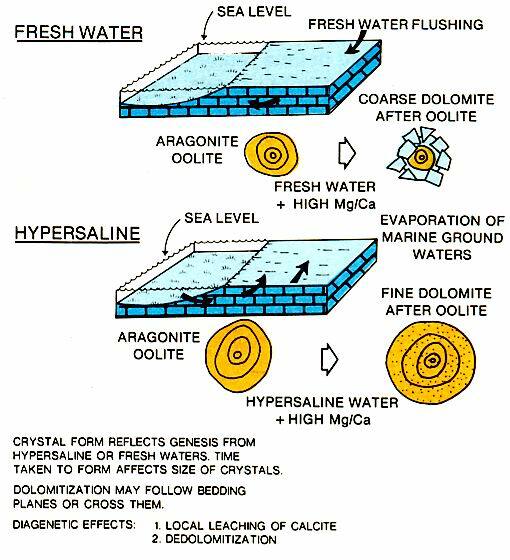 Whatever the model proposed high magnesium to calcium ratios occur in the waters responsible for this diagenesis. This is particularly true of mixing zone brines with different compositions where dolomitization can become locally important. Although the deep burial diagenetic realm is not as well understood as near-surface conditions, it is apparent that dolomitization, pressure solution compaction, and cementation are associated with the deeper parts of the section. The subsurface fluids responsible for the diagenesis are thought to be derived from a variety of sources (figure above), and most likely from down-dip basinal shales and fine carbonates that expel fluids as they are compacted during burial. 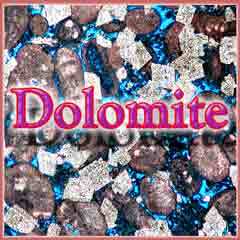 The term dolomite may be used as both a mineral name and a name for a carbonate rock containing more than 50% dolomite. Where good evidence exists that the rock was once limestone, the adjective dolomitized may be used. Although staining is the best method to distinguish dolomite from calcite, development of good rhombohedral structure is typical of dolomites and uncommon in calcites. This criterion should be employed with caution, however. Much mud-sized carbonate material can often be dolomite. The association of dolomite and ancient tidal flat deposits is common. The exact mechanism for magnesium enrichment and subsequent dolomitization is not known, but several theories have been proposed (right figure). Freshwater mixing with marine waters that are washed onto tidal flats and evaporated are likely mechanisms in the tidal flat environment. Mineralogical changes are common in Holocene supratidal flats of arid areas including those of the United Arab Emirates (Butler et al 1982; Swart et al, 1987; and Kendall & Warren 1988). Here aragonitic sediments can be dolomitized and evaporites emplaced in these carbonate sediments (figure below). 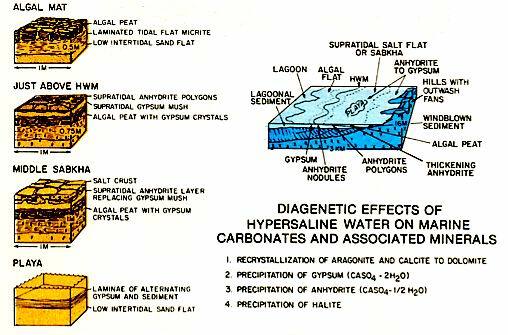 Landward, gypsum followed by anhydrite and halite may be precipitated. The gypsum may form individual displacive crystal laths or layers of mush, whereas anhydrite occurs in contorted layers or as nodules. The origins of the brines associated with this dolomitization is thought to be both marine groundwater influxing from the adjacent Arabian Gulf (Patterson and Kinsman 1977; and Butler et al 1982) and subsurface brines coming from the adjacent Oman Mountains (Wood et al 2001). Where the sulphates precipitate in standing bodies of water, for instance isolated coastal lagoons or playas, they form horizontal layers that parallel the sediment-water interface. The occurrence of evaporites at the updip side of a carbonate shelf or platform is important to the hydrocarbon industry since the evaporites often form the updip seals to reservoirs developed in dolomitized shelf carbonates. Evaporation of near surface waters in the capillary zone of tidal and supratidal flats in tropical and subtropical areas like the Bahamas (Whittle et al, 1992; Shinn et al, 1976) Shark Bay (Logan et al, 1970) and the coast of Abu Dhabi (Kendall et al, 1995) can lead to the precipitation of a carbonate that cements this surface. An increase in magnesium to calcium ratios in the capillary waters is believed to be responsible for the dolomitization of this cemented crust. This setting for dolomitization has been recorded in the Upper Tertiary section of the Bahamas (Vahrenkamp & Swart 1994; and Swart & Melim 2000) and occurs beneath non-depositional surfaces, with the concentration and extent of the dolomitization being controlled by the length of time involved with non-deposition. These dolomites are recognized by their association with the non-depositional surfaces, and are thought to form from cold bottom waters, and in the presence of diffusive temperatures. Two kinds of dolomitization occur in this setting. One is caused by in pore fluids in which the cation and anion profiles are governed by diffusive processes. The dolomite forming here is termed as background dolomite (Vahrenkamp & Swart 1994; and Swart & Melim 2000). These authors record the occurrence of microsucrosic dolomite and explain that this forms both by recrystallization of the existing sediment and precipitation directly into void space. They suggest that dolomitization of this kind has a local source for Mg2+, so that the dolomite never constitutes more than between 5 and 10% of the sediment. The second form of dolomitization associated with this setting occurs in coarse-grained reefal sediments (Swart and Melim 2000). It is suggested that the circulation of normal marine water in a relatively open system explains the pervasive character of the dolomitization and the relatively normal Sr concentrations. Humphrey et (2001) have shown that in the low-flow freshwater lenses and meteoric vadose zones of Holocene and Pleistocene sediments in the Caribbean, some skeletal calcites including red calcareous algae have as much as 40 mol% MgCO3. They propose the additional magnesium as coming from the cannibalization magnesium from the algae. They found no dolomite in these samples but suggest that the very high magnesium calcite is a probable dolomite precursor. They note that Pleistocene red algae from Barbados mixing zones has preferentially partially dolomitized the hypothallus regions of the red algae where there is an increase in porosity. They believe that dissolution-reprecipitation of the high magnesian calcite of the less dense hypothallus in red algae is the start of early dolomitization. This process may explain the occurrence of discreet euhedral dolomite rhombs that often dispersed throughout ancient carbonates that show no sign of regional dolomitization related to ground water movements. The genesis of dolomites that replace limestone in the deeper subsurface is currently explained by two models of fluid-flow that invoke the movement of waters with higher magnesium to calcium ratios in the subsurface. One is related to regional subsurface flow models, or burial-flow models which assume high temperatures for the subsurface fluids (Mountjoy and Amthor, 1994; Nadjiwon et al 2000); and the other less fashionable model assumes the evaporation of seawater in restricted lagoons and salt flats that produce dense near surface brines that move down into porous and permeable limestones and produce coarsely crystalline "early" seepage reflux dolomites (Shields and Brady 1995). Both models require magnesium and fluid to move this but differ in the character of the geochemical setting and timing. The first model requires a longer time period and higher temperatures than the second reflux model. 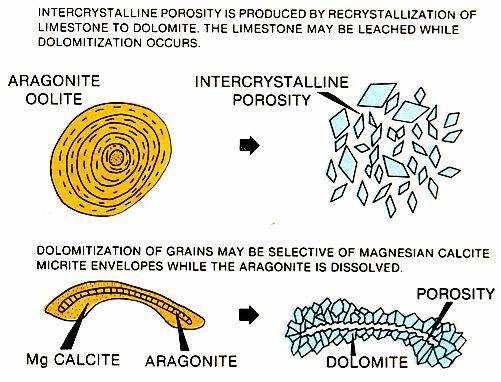 However it is formed, the dolomite has the potential for creating reservoir quality porosity and permeability in originally tight limestones (left figure). Early dolomitization may preserve porosity by creating a rigid framework that inhibits compaction. In still other cases dolomitization in lime muds may enhance porosity, because dolomites are denser and so consequently take up less volume than the original calcite. Intercrystalline porosity in dolomites is responsible for many Paleozoic reservoirs, a good example is the Mississippian Little Knife field carbonates. Dolomitization may reduce, redistribute, preserve or create porosity. In a few carbonate reservoirs, as in the Jurassic Arab limestones of Ghawar field in Saudi Arabia, replacement dolomite crystals extend into adjacent pores thereby reducing the primary porosity. In many dolomitized reservoirs such as the Jurassic Smackover formation of Alabama and the Leduc Reef carbonates in Alberta, porosity and permeability have been redistributed during dolomitization and associated leaching and enhance reservoir character. Porosity that was formed during dolomitization is common in the Mission Canyon and Red River formations of the Williston basin. l982 Butler, G.P., C.G.St.C.Kendall, and P.M.Harris, Abu Dhabi Coastal Flats: in Handford, C.R., Loucks, R.E. and Davies, G.R. eds. Depositional and Diagenetic spectra of Evaporites, a core workshop; Soc. Economic Paleont. Mineral Core Workshop No. 3, Calgary, Canada, p. 33-64. Kendall, Christopher G. St. C., Alsharhan, Abdulrahman. S., and Whittle, Gregory, 1995; Field Guidebook to Examine the Holocene carbonates/Evaporites of Abu Dhabi, United Arab Emirates: for the International Geological Correlation Program (IGPCP-349), U.A.E. University Publication Dept., Dec. 5-7, pp46. 1988 Kendall, Christopher.G.St.C., and John Warren, Peritidal evaporites and their sedimentary assemblages, in C. Schrieber (ed. ), Evaporites and Hydrocarbons, Columbia University Press p 66-138. 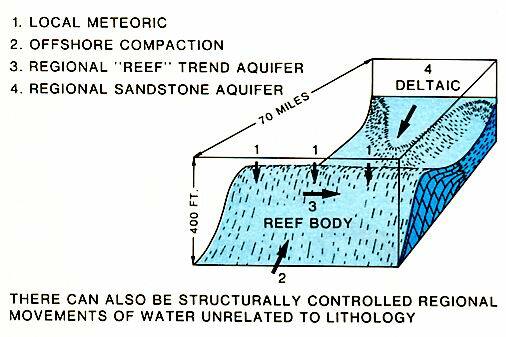 Logan, Brian W., Read, James F., Davies, Graham R., 1970, History of carbonate sedimentation, Quaternary epoch, Shark bay, Western Australia, carbonate sedimentation and environments, Shark bay, Western Australia, Memoir - American Association of Petroleum Geologists, 13, p. 38-84. Mountjoy, E. W. and Amthor, J. E., 1994, Has burial dolomitization come of age? Some answers from the Western Canada sedimentary basin, Purser, Bruce, Tucker, Maurice (, and Zenger, Donald (editors), dolomites; a volume in honour of Dolomieu, Special Publication of the International Association of Sedimentologists, 21, p. 203-229. Nadjiwon, Lisa M., Morrow, David W., and Coniglio, Mario, 2000, Dolomitization of the Devonian Dunedin, Keg River and Slave Point formations of Northeast British Columbia, 2000 AAPG Eastern Section meeting London, ON, Canada, Sept. 24-26; abstracts, AAPG Bulletin, 84 (9), p. 1390. Patterson, R. J., and Kinsman, D. J. J., 1977 Marine and continental groundwater sources in a Persian Gulf coastal sabkha, Studies in Geology (Tulsa) (4), p. 381-397. Shinn, E. A., Lloyd, R. M., Ginsburg, R. N., 1976, Anatomy of a modern carbonate tidal-flat, Andros Island, Bahamas; Klein, G. deV. (editor), Holocene tidal sedimentation, Benchmark papers in geology, 30, p. 352-378. Swart, Peter K. and, Melim, Leslie A., 2000; The origin of dolomites in Tertiary sediments from the margin of Great Bahama Bank; Journal of Sedimentary Research, 70 (3), p. 738-748. Swart, P. K., Shinn, Eugene A., McKenzie, J. A., Kendall, Christopher G. St. C., Hajari, S. E., 1987, Spontaneous precipitation of dolomite in brines from Umm Said Sabkha, Qatar; Dickinson, William R. (chairperson), Geological Society of America, 1987 annual meeting and exposition, Abstracts with Programs - Geological Society of America, 19 (7), p. 862, 1987. Annual Meeting of Geological Society of America, Phoenix, AZ, United States, Oct. 26-29. Vahrenkamp, V. C., Swart, P. K., 1994, Late Cenozoic dolomites of the Bahamas; metastable analogues for the genesis of ancient platform dolomites; Purser, Bruce, Tucker, Maurice, and Zenger, Donald (editors), dolomites; a volume in honour of Dolomieu, Special Publication of the International Association of Sedimentologists, 21, p. 133-153. Wood. W. W, Sandford W. E. Abdul Rahman S. Al Habshi, 2002; Source of Solutes to the coastal sabkha of Abu Dhabi; G.S.A, Bulletin 114, 259-268. Wood. W.W, and Sandford W. E, 2002; Hydrogeology and solute chemistry of the coastal-sabkhas acquifer in the Emirate of Abu Dhabi, Barth & Boer (eds) Sabkaha Ecosystems, Kluwer Academic Publishers, Printed in the Netherlands p 173-185.